Living with chronic illness or pain for any single individual is a pain within itself, but add on Depression, and you feel like you’re dying. I currently suffer from stomach peptic ulcers and heart disease along with my mental illnesses. For some people, their Depression is a side effect of their chronic illnesses. For me, it is a little different. I had Depression before I developed my stomach ulcers. Ulcers are holes in the lining of the esophagus, stomach, or small intestine, and I developed my ulcers from my first suicide attempt, trying to overdose on a variety of pills. Ulcers cannot be cured, but can be treated. In other words, I will live with them for the rest of my life. Having Depression, along with my ulcers, is a constant battle because when I have a flare up in my stomach, I am further reminded of why I have them. Ulcers cause an excruciating amount of pain in your stomach that will have you hunched over crying for hours. It is a gnawing, burning sensation that doesn’t go away until it is ready. There are acid reducers that reduces flare ups, but they come anywhere, at any time. So, when I am in pain, it causes me not to want to do anything, but lie in my bed, in the fetal position. I don’t want to eat because it makes me nauseas, therefore, I sink into a depressed state because I’m not doing anything except wallowing in my pain, being miserable. Living with heart disease and Depression is also a constant battle. I have high blood pressure, and systolic murmur affecting how my valves work. I have to wear a heart monitor every single day, every hour on the dot. I am constantly out of breath, I am always sweating, even when it is 30 and below outside, I will most likely be in short sleeves and have the window cracked in the car or my room. I have palpations that make me feel like I am having an anxiety attack every hour of the day. I can’t do dimple things like brush my hair or teeth without feeling exhausted causing me to want to only sit in my room and do nothing because it is easier that way. I am lethargic and sleepy all the time. If I am not in class, I am in my bed sleeping. There are many other symptoms I could list that make me feel dead all the time, but you get it. These symptoms are those alike of Depression, so I can never really tell if I am depressed or my heart is just acting funny. Chronic illness is very different for certain people. Chronic illness for me hinders my every day activities, so on top of me naturally having zero motivation because of my Depression, I have sickness that makes me feel heavy and sick all of time, enabling my depression. How do I cope with it? Honestly, I have to find different ways to push through it. Sometimes it is calling my parents to receive motivation to just get out of bed, some days I have to just go for a walk around campus to get my spirits up even I don’t feel like it. I will also take my medicine to make sure I am feeling half-way up to par every day, so I can find the strength to go to class. I go to my cardiology appointments whenever I am scheduled, so I can continue to be as healthy as possible, and so I can remind my self that the effort is there. Chronic illness goes hand in hand whether you have Depression because of your chronic illness, or whether you had it to begin with and chronic illness is just another obstacle that you have to deal with. Either way I encourage you to just do your absolute best. There aren’t any set rules that you have to follow to feel good every day because that just isn’t possible when you’re in this situation If you have, make a list of positive affirmations around your room to remind you that your best is enough. If all you did that day was get out of the bed to change your clothes, and get back into bed, that is perfectly okay, because at least the effort was there. If you are having trouble coping with your illnesses, both physically and mentally, please feel free to contact me and we can help each other in the best way we know how. The day I was diagnosed with my mental illnesses, was the day I started to lose the people closest to me. Mental illness is a very serious and real disease, and having someone in your life battling It can be stressful because you don’t know how to help them. The only thing you can do for your loved one, is to just be there for them. For me, I had people there who could handle it, and those who could not. When your loved one is dealing with something as powerful as mental illness, the last thing you want to do is leave them. I had someone in my life who could not handle my mental illness. At first, they were all about helping me through this struggle, and being there with me every step of the way, that is until it got to much for them. By no means am I blaming them for our lost friendship, but I shouldn’t have been blamed for it all either. This person broke off our friendship because they said I was a very terrible friend. This person did not come to me in the beginning and tell me this, so we could fix this and talk about it like real friends would have. This person left me in the dark for months. They no longer answered my texts, they ignored me in public, and wouldn’t say a word to me for about 4 months. This person was my best friend. After months of asking them why they were being so distant because we went from talking and hanging out every day to not saying a word to each other, I felt I had the right to know why my best friend was acting like they hated me. Well, turns out they did. This person finally blew up and told me that I had been a terrible friend throughout our entire friendship and they wanted nothing to do with me ever again. I was so confused and hurt because I wanted to know what I did. After me begging them to tell me what I had done, they told me I was never there for them, and that I never acknowledged that they were my best friend. They said I was self-centered and I always had a problem. They didn’t like that I was always sad all the time, and put a damper on everyone’s mood, and that I needed to shut it off in public. They said the relationship was all about me, and me venting to them all the time, and it was only one sided. Well guess what? They were right. I was battling Severe Clinical Depression and Generalized Anxiety Disorder. In no way am I saying that is an excuse, but yes, I was sad all the time because every day I was trying to find new ways to end my life. I had problems all the time because I was sick mentally and I needed my best friend. I had no idea they felt like I was treating them like garbage, and they have every right to feel that way. In a way, even if I didn’t think I was, I was neglecting our friendship. My illnesses caused me to be distant towards the people in my life, this person included. My illnesses caused me to be tired and never wanting to do anything thus, never really inviting them to do different fun things with me. I promise with everything in me, I wasn’t intentionally being a terrible friend. I was sick and needed help and my best friend just left me because they didn’t understand mental illness. I am not blaming them because a lot of people don’t, but when your best friend, boyfriend, girlfriend, or anybody you’re close with, has an illness, whether it be physical or mental, don’t give up on them. I was never given the chance to say sorry and make things right because they never gave me the chance. They made the decision for the both of us regarding our friendship. They never stopped to think how I would feel if this friendship was over, they just left. There is and always will be a void in my life because they aren’t here to see how far I have come in my road to recovery. They left when things got too tough, and now we don’t even know each other. I will always have so much love for them. To this day, I pray they are happy, even if their happiness doesn’t include me. I miss them very much and the pain gets worse every day, but I have to respect that this is what they want, and how they feel. If your loved one is battling mental illness, please don’t give up on them. Sit down and talk them because they need you more than you need them. They’re sick and broken and they already feel like the world is against them, don’t be against them too. Tell them you love them, and be there through their road to recovery. April 12, 2016 I decided I wanted to take my own life again. My mom found me the next morning unable to move, feeling scared and panicked she rushes me to Children’s Hospital. I was weighing at 100 pounds, my face as grey ever, and me looking sick as ever. That is when things got scary for me. They called social services who told me I was going to be admitted into a Psychiatric ward at Children’s Hospital. I begged my mom to do something but I didn’t have much to fall back on since I was the one in the hospital bed. They told me I didn’t have to do inpatient if I agreed to do intensive outpatient therapy for 1 month, 5 days a week, 3 hours a day. I was really hesitant at first because I was thinking about school and work and a million of other things I was stuck having to deal with since I failed my suicide attempt. It was inpatient or outpatient, so of course I chose intensive outpatient. My grandfather came and sat next to my bedside crying asking me why I would do such a thing? Why would I try to destroy something God worked so hard to create? It had not fully set in at how deep I was in. I was in trouble, I needed help, immediately. I missed school all of that day, my friends were worried sick because I had sent them a shivering text the night before. I attempted suicide on a Friday and they started me on intensive outpatient care at Peninsula Lighthouse that Monday. I was so terrified. It was like started the first day of high school all over again. I didn’t know what to expect or who to expect. I met some of the most amazing people in treatment. These people were just like me, struggling just like me. I wasn’t alone. You’re never alone. I spent 1 month in an intensive outpatient treatment program causing me to miss the first part of the school day and drastically effect my grades. My relationships were non existent at this point, and I just felt completely alone. I didn’t eat, I would self harm everyday just to cope. In IOP (Intensive outpatient care), I learned healthier coping mechanisms other than sleeping and self harming. My therapist was incredible and pushed me to be my very best self everyday, and for that I am thankful. Treatment changed me for the better. If I hadn’t gone to treatment I would be in a psychiatric ward wishing I was dead and making zero progress because I’m just that stubborn. Instead it gave me 3 hours every single day to detox, and to talk about how I was feeling, and to here someone validate my feelings. My problems were never too big nor to small. I was introduced to new medication that has done such a good job in keeping my spirits up. It was exhausting being exhausted everyday. I was sick and tired of being sick and tired. IOP is a program I highly recommend for someone going through a time of self hatred, and a feeling of the only way out being death. No one should EVER feel like dying is the only way for them to be at peace. Everyone deserves peace on earth and a loving support system, and IOP provides both of those. I started going to a private therapist in November of 2014. My parents had to practically drag me to therapy every week. I didn’t think I needed it. I thought I was doing just fine without it, but truth is, I wouldn’t be here without it. I was seeing her regularly for a month until about mid December when she told my parents I needed more help on a bigger scale, a scale she could not provide me. She told my parents I needed to be enrolled into Peninsula’s care immediately. Peninsula is a mental health facility who deals with inpatient and outpatient therapy. My parents enrolled me into a Peninsula’s care with a therapist who also recommended me a psychiatrist who I still see every month to refill my mediations. March of 2015 I was prescribed my first dose of the antidepressant, Wellbutrin. My psychiatrist put me on the highest dosage she could prescribe. I took that daily while doing therapy every week. Throughout my sessions, my therapist thought I needed something else because I seemed to be getting worse, and It was starting to scare her. So, my psychiatrist prescribed me Prozac and then Abilify. I was on those three medications for 2 years, and was recently prescribed another medicine, Zoloft, after another attempt on my life. I currently am on all four medications on the highest doses possible. I take them every single day in the morning with some type of juice. I have been in Peninsula’s outpatient therapy for 3 years now, and was in their Intensive Outpatient therapy for 1 month last year. It has helped me tremendously. I was extremely resistant to both therapy and medication at first, but they keep me alive so I utilize them. The medicine helps uplift me everyday, and aids in helping me get out of bed every single day. It helps divert my dangerous thoughts away while therapy teaches me coping skills to use while on my medication. My dream is to be able to function like a regular person doing day to day tasks without the help of medicine. If you are struggling with mental illness, medication and therapy is the best route to take. It is noting to be ashamed of. Those two things will keep you alive until you’re able to healthily function on your own. If you are a parent watching your child struggle, medicine and therapy will be a good start. It was very hard for my parents to put me on medicine because they were embarrassed which is perfectly normal, but in the long run it will help you or your child healthy again. I consisted of flesh, blood, and bones. If you didn’t know me you would most likely just assume I had super high metabolism, but that was not the case. I was diagnosed, by many physicans and psychiatrists with Anorexia Nervosa. Anorexia Nervosa is an eating disorder characterized by low weight, fear of gaining weight, and a strong desire to be thin, resulting in food restriction. I was very much in denial when I was constantly being told that I was dangerously underweight until one day it made me severely ill. It was late July of 2016 and I was home alone while my family was out running errands. I started to feel sick and disoriented. I was hearing and seeing things that were in fact not there and called my mom freaking out. She reassured me nothing was in the house with me and that I was just being ridiculous. Little did I know she called my dad to check up on me because she was worried that something might’ve been wrong. My head started shaking and I couldn’t keep it upright. My speech began to slur and I couldn’t talk. I began to get scared, but my body wouldn’t move, so I sat there in a catatonic state until my mom got home. She was scared when she found me on the couch not in my right mind so she drove me to the Children’s Emergency Room. Doctors ran tests and found that my vitals were alarmingly low. They put saline into an IV and hooked me up. I was still disoriented until the saline was good in my system. The doctor came back in 10 minutes later and said I was severely malnourished and continued to bring up my weight. He asked my mom if I had been eating and as far as she knew I had been. That was clearly not the case. I eventually told the doctor I hadn’t eaten in about 4 days, and his eyes got as wide as quarters. He wanted to admit me into a psych ward for starving myself, but after much begging and a new diet plan, I thankfully didn’t have to go there. My disorder caused me lots of health problems in the long run. I cheered at the time this was going on so my body became weaker because I was never eating and my immune system became weaker and weaker and became a hindrance to my cheer life. It has caused me to be short of breath by doing just simple things like brushing my hair, or putting on my clothes. My stomach is constantly growling even when I just ate a four course meal. Every where I went I would go to the bathroom and try to throw up whatever I ate, knowing good and well I hadn’t eaten enough to throw it up, so my throat would become raw, and nothing but blood would come up. When people see me, whether it be friends or family, they will say little comments like “oh honey, do you eat?” “You need to eat, you look like you’re dying”, like I already didn’t know. When people have a real life disease, like Anorexia Nervosa , It restricts them from being the person they truly are. They want to be this lively person who always gets invited to things because theyre so fun to be around, but they don’t get invited to things because they’re always tired or always sick. Never tell a person that they need to look a certain way, or that they look like something is wrong with them because that person already believes they aren’t perfect as they are. They feel they need to go to greater lengths to look a certain way. I’ve been told all my life I was little, and for the most part I just grew up skinny, but as I got into the mentality of I had to be bone thin, it started to consume me, literally killing me almost. If you are going through the same thing or know of someone going through this too, Please contact this help hotline and they would be more than happy to talk to you and help you!! March 1, 2018 is self injury awareness day. Self injury, also known as self harm, is the act of intentionally hurting ones self. November 30 is the day where people where a black ribbon on their wrists if they’ve ever self injured. 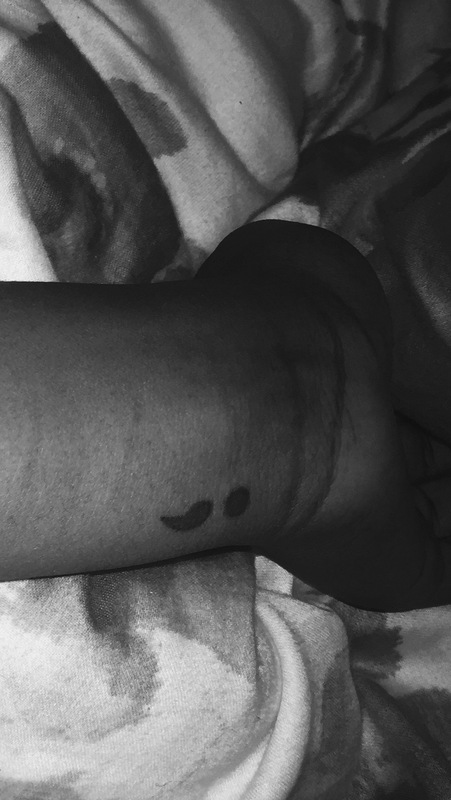 November happens to also be the month I self harmed for the very first time. I had just come home from practice and was angry. I had Depression so I didn’t really need a legitimate reason to be angry, being alive was legitimate enough for me to be angry. I was angry, I wanted to hurt something so I decided to take it out on myself. I had cut myself for the very first time that month. I took a pencil sharpener blade and took it to my left wrist. I made about 3 more cuts on my arm before I stopped for the night. About 3 weeks later I was getting ready for school and my dad had knocked on my door to give me something, I was getting dressed so I cracked the door and just put my left arm out to retrieve what he was trying to give me. I had totally forgotten that my arm was all cut up, otherwise I would ave reached out with my right arm. My dad yanked my arm back and asked me what was on my arm, I told him it was nothing, he didn’t buy it. He slammed my door and went into the living room. I heard him crying from my room. My heart broke. Hearing my dad cry because he was so broken, because he was watching his child harm herself and there was nothing he could do, broke my heart . I then vowed, that night, I would stop self-harming. That vow was broken because the next week I started again. It continued on for 3 more years. It was an addiction. The blades got bigger and bigger, the cuts got deeper and deeper, and the pools of blood on my bathroom floor got harder to clean up. It was brutal. Three years later and my left arm was cut up from my wrist to the top of my forearm. I also cut on my right upper thigh and left lower midriff. I starved myself as another form of self harm. I wouldn’t eat for days and eventually it landed me in the hospital for malnourishment, and eventually I was so underweight that doctors wanted to admit me into a psych ward because I was so very unhealthy. I would purge my lunch at school, if I even ate lunch, and if I did it would be 3 or four crackers so nothing would come up except blood from the constant strain of my stomach muscles being pumped. I was slowly but surely killing myself. My self harming got to the point where it was so bad that I did it every single day causing me to where long sleeves 365 days a year fearful of the looks I would get from my arm looking like It was just attacked by a shark. Self harming is a complicated concept. If you’ve never done it then you won’t know why those of us who do do it, do it. I personally started self harming because I was angry and numb. I was angry and wanted to hurt something, so I hurt myself. I was numb and wanted to feel something, so I cut into my skin, I starved myself everyday. Self harm ruined the relationships I had with people, it restricted what I wore, it took over my life. Millions of teens around the world, boys and girls, self harm every 3 minutes. Sometimes they don’t self harm because they’re trying to kill them selves, sometimes it’s a cry for help or a coping mechanism because it was a coping mechanism for me. So as a celebration of being self harm free I will be wearing a black ribbon on my left wrist on November 30th. If you see anyone wearing one on that day go up to them and tell them to continue to stay strong, because it’s a battle. A dark, silent, painful battle.